Focusing on tourism, hydropower, IT, agriculture, and mining industries, and creating an environment that utilizes the full capacities of existing industries. Provision of a separate industrial security force. Swayambhunath, Bauddhanath, Changu Narayan, Kathmandu Durbar Square, Bhaktapur Durbar Square and Patan Durbar Square. Nepal is located between two of the world’s most populous countries, India and China, with easy access to both vibrant markets. It has significantly lower tariffs on imports as compared with India, which can make Nepal an attractive location even to Indian investors. Other advantages in Nepal are affordable labor, high profitability, low land cost, and an accessible bureaucracy. Nepal is also entitled to preferential treatment in a number of developed-country markets. The natural as well as cultural assets of Nepal also offer a substantial opportunity to investors. The country has a range of climatic conditions– from tropical to sub-arctic. The topography is generally mountainous in the north, hilly in the middle, and near sea level in the south. Nepal grows various agriculture products, medicinal herbs, and high-quality tea. There is also a huge potential for hydropower- approximately 43,000 MW is technologically feasible. Road, electricity, irrigation, water supply and sanitation, housing and urban development, environment, alternative energy, and information technology are included in the infrastructure sector. It is necessary to develop safe, sustainable, economical, user-friendly, and environment- and climate-friendly infrastructure for the prosperity of Nepal. There are many local airlines that connect Kathmandu to different locations of the country. 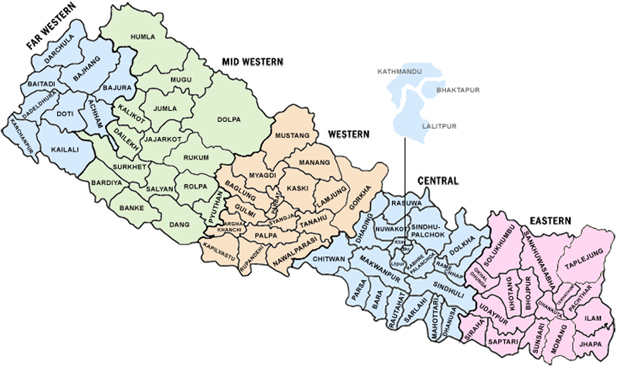 Biratnagar, Birgunj, Pokhara, Nepalgunj, Bhairahawa, and Bhadrapur are the main cities of Nepal where local air connectivity is easily available. STOL (short takeoff and landing) services are also available to connect the capital city of Nepal from hill and mountainous areas. Nepal's urbanization is increasing rapidly. The national population census report of the 2011 finds the national population density is 180 per km2. However, the urban population density is 1,381/km2 and the rural population density is 153/km2. This disparity is the result of the decade-long conflict which caused massive migration from rural to urban areas in search of better services, facilities and security. Presently, approximately 17% of the total population is living in urban areas. 26.1% are engaged in non-agriculture sectors. Nepal is a labor-surplus country that supplies unskilled, semi-skilled, skilled and highly-skilled labor to various labor-importing countries. The Tribhuvan University and other private universities produce skilled human resources. In addition to university courses, various skill-development courses are presented by a number of private and public institutions under the Council for Technical Education and Vocational Training in various fields. There is no shortage of trained human resources. Since the 1950s, Nepal has made progress toward sustainable economic growth, and the country remains committed to a program of economic liberalization. Agriculture remains Nepal's principal economic activity. This sector occupies almost one third of Gross Domestic Product (GDP) with about two third of country’s population are dependent in this sector. Contribution of this sector to GDP was 33.87 percent in fiscal year 2012/13, which is expected to remain at 33.10 percent in fiscal year 2013/14. In fiscal year 2070/71, the annual growth rate of agriculture sector is expected to be 4.72 percent at constant prices of 2000/01. Approximately 25% of the total area is cultivable; another 33% is forested and the rest is mountainous. Rice and wheat are the main food crops. The lowland Terai region produces an agricultural surplus, part of which supplies the food-deficient hill areas. 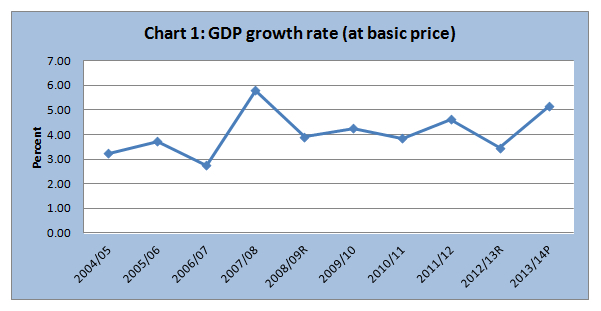 Real GDP at basic prices is estimated to grow by 5.2 percent in fiscal year 2013/14 against the target of 5.5 percent. Such growth rate in the previous fiscal year was 3.5 percent. 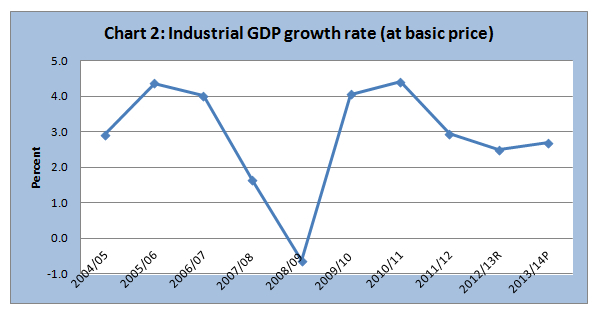 Economic growth rate reached over 5.0 percent in fiscal year 2013/14 after last five years. There has been some progress in economic growth rate in current fiscal year due to favorable monsoon, gradual improvement in investment environment, the environment of political consensus and cooperation, among others. The sector that comprises trade, transport, communication and warehousing, financial intermediation, real estate business, public administration and defense, education, health, and other community, social and personal services and other sectors remained at 49.8%, with the increment of 3.6 percentage points in GDP. However, the contribution in the current fiscal year is expected to be marginally lower than that of last four years. The contribution of the service sector to the GDP has been increasing due to the growth in the transport, public administration, education and other community service sectors among these sub-sectors.